Prostate Cancer Foundation of Australia (PCFA) is a broad based community organisation and the peak national body for prostate cancer in Australia. We are dedicated to reducing the impact of prostate cancer on Australian men, their partners and families, recognising the diversity of the Australian community. We do this by: •	Promoting and funding world leading, innovative research into prostate cancer •	Implementing awareness and advocacy campaigns and education programs for the Australian Community, health professionals and Government •	Supporting men and their families affected by prostate cancer through evidence-based information and resources, support groups and Prostate Cancer Specialist Nurses. PCFA relies on the generosity of individuals, the community and partnerships to carry out our essential work. We acknowledge the advice and direction of members of the prostate cancer support group movement who assisted us by sharing their stories, experiences and historical documents. In particular, we would like to thank our advisory group: Con Casey, David Sandoe, Pam Sandoe, Jim Reid, Jeff Roberts, and Peter Dornan. Their stories are included at the end of this monograph. Photography of advisory group members by Gary Grealy and Murray Vanderveer. Today, prostate cancer is an important public health issue and a major challenge for our health system, its workforce, and for Australian society as a whole. It is now the most common cancer in Australia. By 2017, there will be more than 200,000 men living with prostate cancer in Australia and 80% of these men will be long-term survivors. Survival has never been better, but this is a mixed blessing. Many men live with ongoing physical, emotional, sexual, and practical concerns related to diagnosis and treatment of their prostate cancer that often are not identified or addressed. For some of these men, supportive care is available in the form of prostate cancer-specific support agencies, health professionals, and advice from prostate cancer survivors and their partners. But this has not always been the case. Prostate cancer diagnoses in Australia rose dramatically to increase more than five-fold over 30 years from 3,606 in 1982 to 20,065 in 2012. This increase was largely driven by the introduction of prostate specific antigen (PSA) testing in Australian clinical settings in the early 1990s. Despite controversy, PSA testing was and still is the only widely accessible method for early detection of prostate cancer, and served as an advent for prostate cancer as an escalating health concern for Australian men and the Australian community. Alongside the increasing prominence of prostate cancer as a leading national health concern, treatments continued to improve but left men with ongoing challenging health effects. These effects included urinary, bowel, and sexual problems, and a considerable quality of life burden associated with increased psychological distress and reduced satisfaction with life. In contrast to the burgeoning breast cancer support network, there were minimal support options for men with prostate cancer in the early 1990s, and men, being typically low users of support by comparison to women, largely faced these problems on their own. Further compounding menâ&#x20AC;&#x2122;s isolation, few clinicians referred men to support programs when these were available based it seems on the prevailing view that men would want to handle their problems on their own. In the absence of adequate support, men took matters into their own hands. This monograph tells the story of how Australian men, who had themselves been treated for prostate cancer and their partners, mobilised to help each other. It details how over time, due to the efforts of these men and their affiliations, things began to change; and it explains how this grass roots health movement eventually coalesced into the peak national body for prostate cancer in Australia, Prostate Cancer Foundation of Australia (PCFA). While there is still much to be accomplished, this monograph is a testament to and celebration of the achievements of the pioneers of the prostate cancer support group movement. 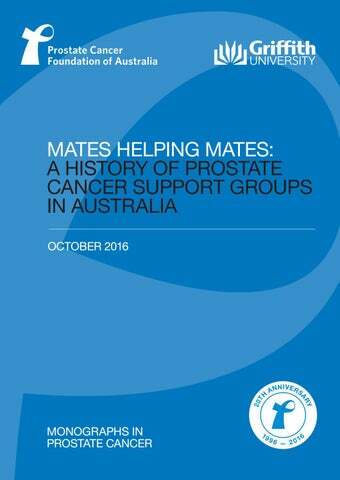 The prostate cancer support group movement described in this monograph begins in the early 1990s and continues up to formal national affiliation with PCFA in the early 2000s. As an accompaniment to this history, men and women who led the way lend their voices and reflections on the movement and future challenges for support groups in Australia. From 2014 to 2015, 21 support group leaders (nineteen men and two women) from across Australia were interviewed to record their recollections of their experiences with prostate cancer and how the support group movement began in Australia. Most of these leaders became involved in a support group between the years 1994 and 2000 and the support groups they were currently involved in had been operating from 5 to 21 years with between 12 and 1000 members. Most of these groups met face to face and were led by volunteers with a personal experience of prostate cancer. Researchers from the Prostate Cancer Foundation of Australia and Griffith University Prostate Cancer Survivorship Research Centre gathered this information and compiled these stories as a record of the important work undertaken by men with prostate cancer and their partners over the past two decades to improve survivorship outcomes for men with prostate cancer and their families. These interviews were carefully recorded and transcribed to capture the rich details of events. Historical details were checked against archival materials such as newsletters and group meeting notes and minutes. To further confirm the story a focus group was held in June 2015 in Sydney with six of these leaders - again from around the country. Australian support groups began to emerge in 1993, first in New South Wales (NSW) with the formation of Prostates Anonymous, a self-help group. In the following years further groups emerged independently of each other throughout the country. Many of these groups were initiated independently of health services while others had informal partnerships with local health professionals who supported meetings with venues and occasional guest speakers. During these formative years some groups worked to raise public awareness about prostate cancer and initiated informal connections with other support groups or health agencies. Independent advocates within these groups were important in driving towards a national collective. For example, in NSW the leader of Prostates Anonymous, Peter Schade, partnered with Us Too International to form Us Too Australia, that later merged as a division of the Continence Foundation of Australia in 1995, and in 1996 changed form again to become Prostalk, becoming now independent of these earlier affiliations. However, Prostalk was highly defined by its leader and so ended in 1998 when Peter died. At this conference the support groups declared PCFA as the peak national body for prostate cancer and the APCSG became the Support and Advocacy Committee (SAC) within PCFA’s governance structure. The timeline for the prostate cancer support group movement up to formal national affiliation with PCFA (1993-2001) is shown diagrammatically on page 6. SAC continues today in a modified form as the National Support & Community Outreach Committee of PCFA. Max Gardner AM who was a key figure in the movement, died in 2004. In his honour, PCFA’s highest level of recognition for outstanding and significant contributions to prostate cancer support groups is named the Max Gardner Award. A list of recipients of the Award can be found at the end of this monograph. Over the next decade more support groups formed under the umbrella of PCFA and today approximately 170 support groups are affiliated with PCFA. In this same period two organisations emerged in NSW which played a pivotal role in the national movement. In 1998 a committee of support group representatives from the greater Sydney and Newcastle area formed the Association of Prostate Cancer Support Groups that had a state focus but hoped to connect support groups nationally. In 1996 Prostate Cancer Research Foundation (PCRF) formed with a primary focus on raising funds for prostate cancer research and the Association of Prostate Cancer Support Groups (APCSG) led by Max Gardner AM moved to affiliate with this organisation. As this occurred another NSW based fundraising group, the Australian Prostate Cancer Foundation (APCF) also emerged. In 1999 negotiations between the PCRF, APCF and APCSG led to the formation of PCFA. Within this the APCSG maintained its own identity and autonomy. It was not however until 2001 that the relationship between the national support group movement and PCFA was clearly and formally established. At this point there were 40 support groups across the country. The key pivotal moment was an Inaugural Conference of Affiliated Prostate Cancer Support Groups (organised by PCFA) that provided the first national forum for support group representatives across Australia to connect and devise strategies to address priority issues for prostate cancer survivors and advance the broader movement. The process of establishing new support groups was described as one in which men and women of ‘like’ minds, but often different social backgrounds, came together. Many groups actively involved female partners either as leaders or in support roles. The process involved identifying champions to take a lead role in starting new groups. Some groups formed partnerships with doctors and allied health professionals, whilst others were independent of them. Men also described developing management strategies for organising their groups. For example: Well, bearing in mind I’d just been diagnosed with prostate cancer there was very little information about it, so we – and working with a urologist we realised that there are other people in the same area and we wanted to make it easier for others that were going through the same thing. So that’s how we started to loosely connect and then we all came together. Well the group developed because first of all, we had a nucleus group of people who used to meet regularly. We’d always have a guest speaker, and we would publicise it as best we could through the newspapers. They know what it’s like to give the treatments but they don’t understand the effects really, they can tell you what the side effects may be but they don’t understand what it’s like to personally experience them, and I think that’s where the support groups had a great benefit in the early days, and still do have actually, that men can relate to other men about how they’ve got through it, and in many ways, I think there’s a factor of inspiration when you talk to somebody who’s been there and done it and he’s still around and he’s alive, he’s talking about it and looks to be in reasonably good health. Establishing credibility with health professionals so that they would refer newly diagnosed men and their partners to support groups was an early issue. Many were initially dismissive and maintained their distance. However, over time many sought relationships with the groups to enhance their own credibility: I think being a new organisation, a new movement, I think one of our greatest challenges was getting credibility with the medical profession. We were something new. I think it probably as one generation died off, the younger ones saw us as a potential, um, feeding place for a start. And – and a place to improve their reputation and … I think they were quite happy to be involved with it as – as professionals were. Men described how they discovered other groups and how they felt that by working together they could learn from one another, share ways of doing things, and avoid duplication. For example: So when I started running the groups, I was looking around. I found that there were groups around all over the place but nothing was affiliated with them, they were all running their own things; their own bulletins, their own everything. Everything was being duplicated all the way through. Well, I – when I got involved in the group, I sort of kept my ears and eyes open for other groups. As far as I was concerned, you know, we were maybe the first group in Australia. No, we didn’t have a clue. And so when I’d hear that there was another group, I would make contact with them one way or another. Just to talk to them and just see how they operated and tell them how we operated and just share what we had and what we did and that’s that. In time these loose connections evolved towards the formation of an Australia-wide association of support groups: Our main purpose was to investigate how we could expand it, you know, to help each other, that was the original intent. But then, you know, we certainly got it on the roads of forming an umbrella group. You had a lot of people who had like mindedness and they were doing pretty well what we were doing but we were all doing it independently and we started to get a bit of feedback from one another. You get to know things and just over the years we just got the feeling that there was something happening around Australia. Some group leaders, however, were suspicious of the move towards a national association and argued that more could be achieved by retaining control at a local level: There was a fair bit of suspicion of centralised authority. Now this is fairly common in the country, that – they said that when we very first started; why would we raise funds for PCFA when you’ll never see them again, and we can do more with it locally. So they were a little bit wary of PCFA. So they passed the motion very quickly that they wouldn’t at least – they wouldn’t for two years think about affiliation with PCFA, that they would just see how they went. Those who argued for a national umbrella association understood the importance of prostate cancer survivors speaking with a single voice when advocating for change. But by PCFA joining together through all branches, and this is what Max did. He pulled us all together and formed one foundation and that’s been why we’ve been able to make such a big difference as a national group. We wouldn’t have gone into that situation if we didn’t think it was – it was not going to be some good out of it. We looked at the breast cancer situation, they had organisations all over the place and here was our chance… All come together… We needed a national voice... We were looking for a national voice. Group leaders and health professionals had to learn how to work together: Now in the early stages, obviously, there was a bit of scepticism from the doctors and from the actual patients. We got used to each other, you know? They were a bit wary what they could actually say to us because it was early stages and we were a bit wary of them but that obviously grew into a very good relationship in time. There was a growing recognition that the movement needs to embrace the diversity of the Australian community, including cultural diversity and sexual orientation, as well as the different needs of younger men, partners and carers, and men with advanced prostate cancer: The younger you are when you’re diagnosed, the less people want to attend a meeting. So guys get a diagnosis when they’re in their 40s and coming along to sit with a group of men that are in their 65 to 80 isn’t really desirable. And the other thing is we’ve got to attract people to support groups, but then there’s another point that not everyone wants to go to a support group, like, there’s high powered business people that wouldn’t fit necessarily comfortably in a support group setting – they’ve got to be connected to the network by way of receiving a newsletter, by way of telephone counselling, whatever. So they’re the challenges that we face today that are – we’re working on in the various areas, so it’s not – a support group network is not turning up to a support group every second week or every month necessarily. It’s being connected to PCFA by a network in whatever form. We’ve got five or six, there might even be more than that now, support groups for gay and bisexual men, just the difference of their requirements to what it is for heterosexual men, as there’s been a whole new criteria of needs come out and information booklets for guys that are gay and bisexual. It just depends on how committed people are to be volunteers in the future and where people want to go, don’t you think? Are the young Australians going to be as interested in community welfare, that’ll be the issue. So it’s getting that infrastructure, and as often as they said, you have to try and find somebody that’s going to take over your group for you, finding someone that’s younger than you that is interested to take it over is another thing Succession planning is certainly a challenge for any group leader, there’s no doubt, and of course maintaining the quality of your management committee is another matter that you have to constantly keep an eye on. You must make sure that the people involved in your committee are not running around saying things that they shouldn’t say, make sure that people are constantly aware of what’s required. The movement has continued to grow strongly since the Inaugural Conference of Affiliated Prostate Cancer Support Groups. From 40 groups back in 2001 the network has grown to approximately 170 affiliated prostate cancer support groups representing every state and territory in Australia. In addition to groups with traditional face to face meetings, the network now includes telephone based, sport and fitness and online groups. In recognition of the diversity of modern Australia there are specific groups for gay and bisexual men, partners and carers, culturally and linguistically diverse communities, men with advanced prostate cancer and younger men. In June 2016 PCFA launched two exciting new initiatives: PCFA Online Community and its first prostate cancer webcast. PCFA Online Community is free and features a community forum for all those impacted by prostate cancer to share experiences and connect with one another, personal stories, a research blog and a video gallery. The webcast was the first of a planned series of Q&A style events featuring prostate cancer experts and live audience interaction. These recent developments demonstrate that the prostate cancer support group movement in Australia not only has a proud past, it also has a progressive future. Over the years the growth has necessitated several changes to the governance structure established in 2001. The most recent being the establishment in 2016 of the National Support & Community Outreach Committee to advise the National Board on all aspects of PCFAâ&#x20AC;&#x2122;s support and community outreach programs. The new governance structure is designed to address the succession planning challenges described earlier, to ensure committee membership has regard to the diversity of the Australian community, and that PCFA continues to look to the future in terms of program delivery. BEGINNINGS: EARLY RESEARCH ON PEER SUPPORT IN PROSTATE CANCER IN AUSTRALIA Steginga SK, Smith DP, Pinnock C, Metcalfe R, Gardiner RA, Dunn J. (2007) Cliniciansâ&#x20AC;&#x2122; attitudes to prostate cancer peer support groups. British Journal of Urology International. 99(1):68-71. Steginga SK, Pinnock C, Gardner M, Dunn J, Gardiner RA. (2005) Evaluating peer support for prostate cancer: The Prostate Cancer Peer Support Inventory. British Journal of Urology International. 95(1):46-50. Dunn J, Steginga SK, Rosoman N, Millichap D. (2003) A review of peer support in the context of cancer. Journal of Psychosocial Oncology. 21(2):55-67. Steginga SK, Pinnock C, Gardner M, Dunn J, Gardiner RA. (2002) Peer support groups for prostate cancer in Australia: A snapshot in 2002. Cancer Forum. 26(3):169-172. Con Casey In 1996 Con Casey joined the recently formed prostate cancer support group at Royal North Shore Hospital after a long career in the electrical contracting industry. He became the group’s first group leader. In 1998 he helped organise a meeting of support group leaders from Sydney, Central Coast and Newcastle which led to the formation of the Association of Prostate Cancer Support Groups (APCSG) under the leadership of Max Gardner. Con became the organisation’s Honorary Secretary. Con was strongly involved in organising the Inaugural Conference of Affiliated Support Groups in June 2001. at which PCFA was declared to be the peak body representing the interests of those affected by prostate cancer throughout Australia and New Zealand. Over the years Con served on many prostate cancer and general health related committees. He recently retired from the management committee of the North Shore Prostate Cancer Support Group but remains an active member. A Reflection I was diagnosed with prostate cancer in 1994 and underwent a radical prostatectomy in January 1995. I had a “focal margin involvement”. Some of my post op experiences, which were passed off as medically unimportant, were a real concern to me at the time. I thought I should have been better prepared. I was already concerned about negativity to PSA testing and even early treatment of the disease, expressed by high profile health related executives in the media. There was no balance. I thought men deserved a better deal than that. I attended a meeting of the Royal North Shore Prostate Cancer Support Group in February 1996. A plea for leaders was made. At the next meeting I was out the front and wondering “what am I doing here?”. I was the group leader. When the Association of Prostate Cancer Support Groups emerged in 1998 I was pleased to accept the position of Honorary Secretary in the new organisation, under the leadership of Max Gardner, act on its behalf as consumer representative on a number of prostate cancer and general health committees, review publications and be heavily involved in the Inaugural Conference of Affiliated Support Groups in June 2001a huge but rewarding task. I recently retired from the management committee of the North Shore PCSG but I remain an active member. With three sons and six grandsons, there is no escaping concerns about prostate cancer. It is now over 20 years since my operation. My PSA has just drifted over 1 but it doesn’t cause me any grief – mentally or physically. I intend getting on with it and enjoying the wonderful friendships I’ve made along the way. Jim Reid Jim was born in Scotland in 1941 and emigrated to New Zealand in 1961. He is married with one daughter and 4 grandchildren. He worked in the insurance industry in New Zealand till 1976 then returned to Scotland for 4 years working in local government. Jim returned briefly to New Zealand before settling in Melbourne in 1982 working as a forklift driver until 1992. Jim then moved to country Victoria (Shepparton) and was manager of a company involved in the hospitality industry before retiring at 60 in 2001. Feeling too young to retire, he took a part time job in a local Newsagency. Jim was fully retired at 70 in 2011 and dedicated his spare time to the PCFA Victorian Chapter. He is a keen golfer and spends holidays in Scotland catching up with family. A Reflection During a random medical in 1996 an abnormal PSA was detected. On further exploration it was diagnosed that I had an aggressive tumour growing in the prostate gland. I was 55 then and thought that I was too young to have prostate cancer. Having emigrated from Scotland aged 20 I was unaware that my father and maternal grandfather had both had prostate cancer. I had a radical prostatectomy in 1997. During my regular checks with my urologist it was discovered that my PSA levels were rising again and it was decided that a course of radiotherapy could destroy any cancerous tissue missed in the original surgery. Radiotherapy was successful and my PSA level returned to and has since stayed normal. On recovering from my original surgery a GP who was also recovering from prostate surgery decided with the help of 2 continence nurses to see if anyone in the locality was interested in sharing experiences. I attended a meeting and in 1998 the Shepparton (Victorian) Prostate Support Group was formed. After attending an International Prostate Conference on the Gold Coast, a few Victorian and Tasmanian survivors got together and formed the Victorian Chapter of PCFA. My aim was to establish as many support groups as I possibly could in Northern Victorian and with the help of some fellow Chapter Councillors we established 6 new groups. I resigned from Council after 6 years but am still active in the running of my local Shepparton Support Group. David Sandoe OAM David was diagnosed with prostate cancer in 1996. Both he and his wife Pam commenced telephone counselling other men, the wives/partners and families before being asked to lead the Prostate Cancer Support Group Network at the Sydney Adventist Hospital (SAH) which they did for over 13 years. David retired as the National Chairman of the Prostate Cancer Foundation of Australia (PCFA) on 31st March 2015. He had various other roles including Chairman of the: — National Public Awareness & Education Committee — NSW/ACT Board — NSW/ACT Support & Advocacy Committee — National Support & Advocacy Committee (Co-Chair) — National Support Groups Committee (Acting). David also held various board, committee and membership roles with Cancer Council NSW, Cancer Voices NSW, Cancer Voices Australia, NSW Oncology Urology and the Institute of Magnetic Resonance Research at the University of Sydney. He continues to serve on various research boards and committees involved with prostate cancer. David was awarded an OAM in the Queen’s Birthday Honours announced in June 2006 for service to community health through support for men diagnosed with prostate cancer and their families and to the insurance industry. Pam Sandoe OAM Pam was co-leader of the SAH Prostate Cancer Support Group for 13+ years. Pam was instrumental in setting the program for the full calendar year and inviting and organising the medical professional guest speakers for each monthly evening meeting. These presentations appeared in the SAH PCSG Network Monthly newsletter and reached in excess of 800 people. The DVDs, produced from these presentations, were made available through the Cancer Support Centre, Jacaranda Lodge, Sydney Adventist Hospital and through YouTube on the PCFA network. Pam has also been extensively involved with PCFA during its development assisting in a wide variety of roles such as secretary to executive meetings, national and state support group meetings, conferences and teleconferences across the nation. Pam, like David, telephone counsels and has supported David in his many roles with PCFA. She has also attended many functions, made presentations and produced written reports as feedback to the PCFA Leadership Team. A Reflection As we reflect on the last 20 years much has changed in the prostate cancer world for the better because of the incredible efforts of all involved with PCFA â&#x20AC;&#x201C; not the least of which are the many dedicated and committed men and women volunteers of the support group network across Australia. We all still have a long way to go to ease the burden of the disease on men, wives/partners and families. However, with PCFA now widely recognised as the peak body for prostate cancer in Australia and underpinned by an extensive support network, this augurs well for the future. We are fortunate, as a couple, to have met many members of the support group network and experienced, first hand, the camaraderie that exists in every State and Territory. It is something to behold. Long may it continue. Jeff Roberts Jeff was diagnosed with prostate cancer in January 1999. Following successful treatment he became involved in support groups and numerous awareness, advocacy issues. Jeff was a member of the: — Adelaide, Mitcham Support Groups for 17 years — Prostate Cancer Action Group (SA) for 17 years — PCFA Support and Advocacy Committee in 2007, PCFA Central Australia Chapter from 2009 – 2011 He also volunteered with the Cancer Council SA for 9 years until 2009, and served as a consumer representative on both SA-PCCOC and PCFA SA Board. Jeff has been involved in many PCFA activities and in 2009 his efforts were recognised with the Max Gardner Award. After resigning from the Prostate Cancer Action Group (SA) at the close of 2015, Jeff has continued his involvement with the Adelaide-Mitcham Support Group. A Ref lection I had my initial test for prostate cancer in 1995 aged 59. My GP was very vigilant and gave me both PSA and digital tests. In late 1998 I had a further test which showed a low PSA (1.4) but the digital test revealed a possible problem. A referral to a Urologist in early 1999, led to a biopsy and the resultant Gleason Score showed a medium grade cancer. I was given the option of a radical prostatectomy (no robotic then) or radiotherapy. The diagnosis came as a huge shock to me as I had no symptoms or other health problems. My wife, who gave me great support, and I decided I should seek a second opinion which unfortunately did not really help. We then learned of a meeting of the Adelaide Support Group and gained significant information and support from attending that meeting. As a result I obtained a third opinion and then opted for a radical prostatectomy. Seeking these further opinions enabled me to be much better informed. Following successful treatment I have been consistently involved in support groups and awareness issues for 17 years. These activities have been a very rewarding experience for me. Peter Dornan AM Peter Dornan has been a physiotherapist in the fields of Sports Medicine, Manipulative therapy, Menâ&#x20AC;&#x2122;s Health and Pelvic Pain for 50 years. He has worked with many international sporting teams, including the Queensland Rugby team, the Wallabies and the Kangaroos. He has also been an Olympic advisor and Commonwealth Games Physiotherapist. In 2000 he was awarded the Commemorative Australian Sports Medal for Achievement in Sport. He has written eight books, two on sports injuries, one on incontinence, one on pelvic pain and four military histories. He is the Founder and, for 20 years, has been the convenor of the Brisbane Prostate Cancer Support Group. For 40 years he has been a classical sculptor with works in many prominent institutions. In 2002, Peter was appointed as a Member of the Order of Australia (AM). A Reflection In 1996, at the age of 52, I was diagnosed with prostate cancer. I chose surgery for treatment and endured the debilitating side effects of incontinence, impotence and psycho-social effects virtually by myself. Because of these unmet needs, I founded the Brisbane Prostate Cancer Support Group. Our group now has 1000 members, the largest of any support group of any cancer in Australia. 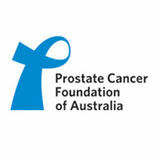 We have affiliated with 32 other groups to form the Queensland Chapter of the Prostate Cancer Foundation of Australia. Our immediate aims were firstly, to educate ourselves then to create awareness of prostate cancer in the community, and finally to stimulate research on every aspect of prostate cancer. On review, we have very clearly been part of the mechanism to have fulfilled these aims. One of the great rewards has been to witness the assistance given to a newly diagnosed man and his partner as they come to grips with the diagnosis and decision making process of treatments and dealing with the side effects of any intervention. I have also witnessed, with pride, the role our group and others, such as PCFA and Cancer Council Queensland have played on forcing cultural change on the Menâ&#x20AC;&#x2122;s Health movement and the way men now approach their health. Max Gardner The Max Gardner Award for Distinguished Service is a most prestigious award presented by Prostate Cancer Foundation of Australia to an individual that has made an outstanding and significant contribution to reducing the impact of prostate cancer on the Australian community. Max was a passionate advocate for cancer support services. He was diagnosed with prostate cancer in 1995 and firmly believed that if his cancer had been diagnosed earlier he still might be around today. With this thought in mind, he became an advocate for early diagnosis and dedicated himself to ensuring that other men diagnosed with prostate cancer would have a better chance in life than he did. From diagnosis until his death in October 2004, Max worked tirelessly to raise the level of community awareness about prostate cancer, to promote research into the disease and to support men and women dealing with prostate cancer. He was instrumental in establishing the prostate cancer support group network with other likeminded men and women. Max also published a newsletter for his own St Vincentâ&#x20AC;&#x2122;s Hospital Prostate Cancer Support Group in Sydney and served on numerous educational, scientific and generic cancer committees and boards.